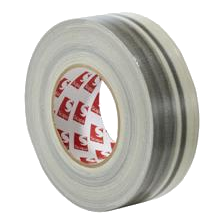 3105 is a specialist performance, polyethylene laminated waterproof cloth tape, coated with a pressure sensitive adhesive and specifically designed to meet the stringent technical requirements of the nuclear industry. 3105 is available in a unique black/white streaked colour effect. Specifically designed for use in the nuclear construction industry and can be supplied to meet the requirements of DEF STAN 81-25/3, if requested at time of ordering. Can meet the stringent technical requirements of DEF STAN 81-25/3, if advised on ordering. Packaging : Scapa branded, bulk packed using interleaving sheets between layers. Note: Information on stock items, non-standard sizes, and lead times is available on request.